LONG BEACH, Calif., March 13, 2017—An analysis by KPMG LLP validates the methodology PierPass Inc. uses to calculate the cost of operating the OffPeak extended gates program at the Ports of Los Angeles and Long Beach. Annual PierPass financial reviews have found that the OffPeak (night and weekend) truck gates cost significantly more to operate than terminals recover through the Traffic Mitigation Fee (TMF) charged on weekday daytime container moves. Based on its analysis of the data and methodology used by PierPass’s auditors and maritime industry analysts, KPMG found that PierPass’s position is well supported. The analysis by KPMG, an audit, tax and advisory services firm, was conducted on behalf of PierPass, working with the chief financial officers of both the Port of Los Angeles and the Port of Long Beach. 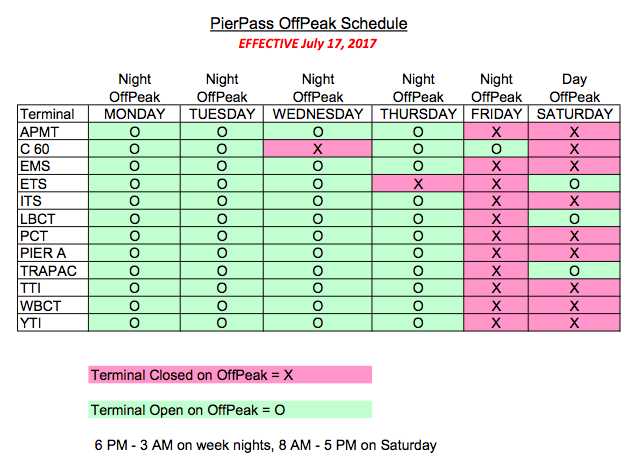 The report, “Analysis of PierPass’ OffPeak program cost calculation,” is available at https://www.pierpass.org/about-2. KPMG’s analysis found that the 2015 costs reported by PierPass are consistent with the underlying data and methodology used in program calculations. This observation of consistency applied to each of the four major cost categories (ILWU and non-ILWU labor, equipment and administrative costs). The analysis included testing of the methodology and assumptions used to calculate gate and yard costs, the offsetting cost reductions during Peak (weekday daytime) shifts and the number of containers subject to the TMF. KPMG found no major issues with the data used, and found that the methodology used is a reasonable approach to calculating the cost. KPMG also conducted sensitivity analyses using two alternate methods of gauging the costs of the program. Using a revised assumption about current terminal efficiency compared with efficiency in 2005 before the OffPeak program began, KPMG found an estimated cost of $108 per TEU (twenty-foot equivalent unit), approximately 17% higher than the $92 per TEU cost calculated by PierPass and 56% higher than the actual Traffic Mitigation Fee of $69.17 per TEU collected during 2015. KPMG also used a second alternative method involving an estimate of fixed versus variable man-hours used in OffPeak shifts. By this methodology, KPMG arrives at an estimated actual cost of $93 per TEU, about the same as the $92 per TEU calculated by PierPass. KPMG noted that the actual TMF in 2015 of $69.17 charged per TEU was about 25% less than the $92 per TEU calculated costs of the program. In other words, the TMF is covering only about 75% of the cost of the extended gates, confirming that the terminals are operating the OffPeak program at a loss. In order for the TMF charged to exceed the actual cost of operating the OffPeak program, the cost calculations would have to be overestimated by more than 33%. KPMG confirmed that the majority of the 2015 OffPeak program cost before accounting for estimated Peak (day) shift cost reduction is comprised of ILWU labor costs. It found 77% of OffPeak program costs were for ILWU labor, 11% for non-ILWU labor, 9% for equipment costs and 3% for PierPass administrative costs. KPMG also examined the data used to calculate costs for ILWU labor. KPMG found the PierPass data consistent with the hourly data collected and maintained by the Pacific Maritime Association (PMA), which manages the ILWU payroll. Since the start of the OffPeak program in 2005, Traffic Mitigation Fees collected have been divided among terminals according to the relative volume of all loaded containers at each terminal (including Peak, OffPeak and intermodal). The revenue individual terminals receive hasn’t been directly based on that terminal’s costs, which could subsidize inefficiency, and would also disclose confidential financial data to competitors. Individual terminals, which are private companies and/or units of larger public companies, don’t share their internal financial data with competing terminals or with their landlords, the ports. The terminals share their internal cost data, on a confidential basis, with the maritime industry analysis firm that calculates the cost of the OffPeak program. That firm (currently SC Analytics) also obtains ILWU payroll data from the PMA. SC Analytics then aggregates the cost data across terminals and uses it to calculate the overall cost of providing extended gates. KPMG was given confidential access to both SC Analytics data on individual terminal costs and PMA data in order to conduct its analysis. The process for estimating the amount terminals save on Peak (weekday daytime) shifts by shifting cargo to OffPeak shifts could be revamped, as it relies on comparisons to terminal operations before the OffPeak program began in 2005.